There is a common conception that the major causes of weight gain and obesity are from excess carbohydrate intake rather than the “calorie is a calorie is a calorie” theory of weight control. When I say “calorie is a calorie is a calorie” I mean that weight gain/loss is affected solely by the amount of calories and not by the source of calories. So with this theory, no matter if you consume all your calories from carbohydrates or protein or fat, the only thing that really matters is the amount of calories consumed. Thus, consuming too many calories leads to weight gain while consuming too few calories leads to weight loss. While many people believe that calories are the sole determinant in relation to weight control, many others believe that carbohydrates are to blame for obesity and the causes of weight gain and that the amounts of calories consumed is not as important as the amount of carbs consumed. So are these people right? Do carbs make you fat? Here are a couple studies that give some insight to the question of “Do carbs make you fat?” and the causes of weight gain. So let us go over some studies to possibly make the debate a little clearer. The most recent study conducted on the topic was published Juned 27, 2012 in the Journal of the American Medical Association. The study concluded that the body may use calories from low-fat diets much more effectively than calories from low-carb diets, and thus, a low-carb diet would result in greater weight loss. In the study, the subjects were a group of obese volunteers. The conductors of the study had the subjects lose weight at the start of the study. They lost 10 to 15 percent initially by reducing their caloric intake by approximately 60% of their predicted “needs” during a 12 week period. During this time period, the subjects’ diets were carefully monitored and controlled to ensure weight loss. After the initial weight loss, the subjects were then put on one of three different calorie plans to maintain their new body weights. The three diets were low-fat, low-glycemic index, and low-carbohydrate. For the next 4 weeks, the total energy expenditure (calories burned during exercise and at rest) was measured. The results of the study showed that the subjects on the low-carb diets burned more energy than the low-fat diets, but the source of the energy loss was not determined. In conclusion, study simply implied that low-carb diets are simply less efficient and result in calories wasted during metabolism, and as a result, promote weight loss. In a study conducted in 1964, however, the idea that a calorie is a calorie is a calorie held true. Investigators conducted a study on 5 obese patients at the Institute of Metabolic Research in Oakland, California. In the study, the subjects were given a full liquid diet containing an exact number of calories with the sole purpose being to promote weight loss. The amounts of the macronutrients in each of the patients’ diets were changed every couple weeks. They were initially given diets with 34% from protein, 52% from fat, and 14% from carbohydrates. That was then changed to 27% from protein, 13% from fat, an 60% from carbs before finally being changed to 14% from protein, 83% from carbs, and 3 percent from protein. The results of the study concluded that the patients lost weight at a constant rate regardless of the proportions of macronutrients. I wanted to start this article by explaining that there is not a concrete answer to this age old question. 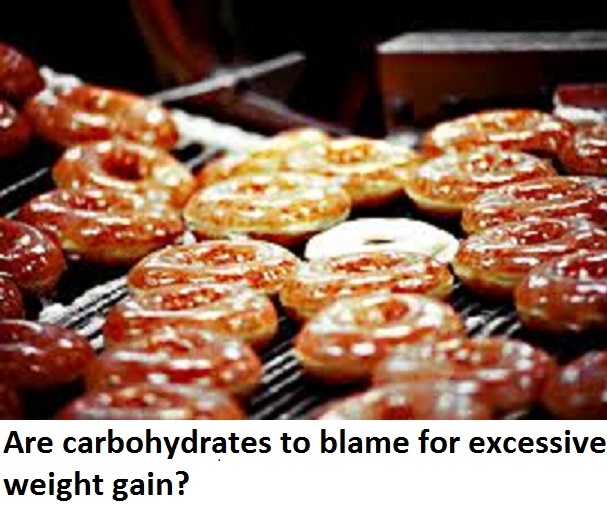 If I were to be asked the question of “Do carbs make you fat?”, the answer would be “yes and no.” In a controlled environment in which everything you eat is monitored as well as your energy expenditure, it is not really much of a debate. If you burn more calories than you are in-taking, you will lose weight. But weight loss is not that simple and there are many different factors. For starters, our bodies are designed to store fat. The whole premise of survival is to store energy and defend fat so that you do not starve to death.This is why overeating is so common. The mechanisms in the human body that are supposed to tell you when enough is enough in regards to how much to eat are not as effective as the mechanisms that tell you when you need to eat. This is because are bodies are designed to survive and excess fat storage ensures survival. The real solution to weight loss, in my opinion, simply comes down to what you should eat rather than the calories you are eating. Nature is designed in such a way that the foods that are best for us are the foods that promote weight loss and health. Most processed food companies’ advertising schemes are based on the premise that health is simply calories in and calories out. 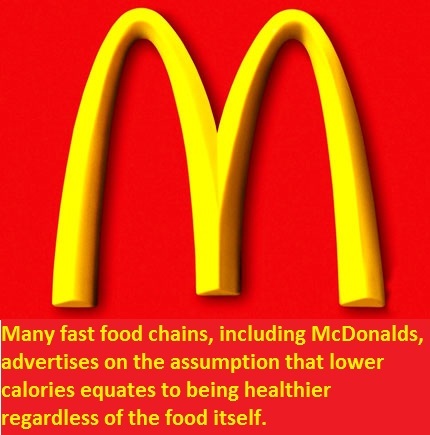 That is why you see McDonald’s offering low calorie options. Our culture in regards to weight loss is based on the idea that low calories is equivalent to better health. Although calorie control is extremely important in terms of health, this is not a very accurate statement. No matter how you look at it, McDonalds is not healthy. If I were to give you half a big mac instead of a whole big mac and tell you that it has half the calories, would that make the big mac any healthier? While it would be better to limit calorie intake, that big mac is still not healthy no matter how much of it you eat.The source and quality of the food is bad regardless of the quantity. If you were to limit your portion controls to lesser quantities, you would be healthier, but you would not be healthy. There is also a reason that it is easier to consume more calories of “bad” food versus “good” food. “Bad” foods are so much less filling for the same calorie amount. It is much more difficult to consume 1000 calories of fruits, beans, and nuts than it is to consume 1000 calories from a BK whopper, fries, and a coke. When people say carbohydrates are “bad,” it sounds funny to me. Certain carbohydrates are bad just like certain proteins are bad just like certain fats are bad. The carbohydrates you want to avoid are the processed carbs that are far from their natural state. When you eat a fruit or a vegetable, yes you are eating carbs, but you are eating so much more. You are getting vital nutrients, fiber, vitamins, minerals, antioxidants, etc. When you consume fruits, the reason they are so much more filling than, say, a cheesecake, is because of their fiber. Fiber is indigestible by the body and thus, causes satiety with less calories. Fiber also has other numerous benefits, most importantly, in regards to helping your bowel movements. With a low carbohydrate diet, you are decreasing the nutrients that are vital for optimal health, as well as your fiber intake. 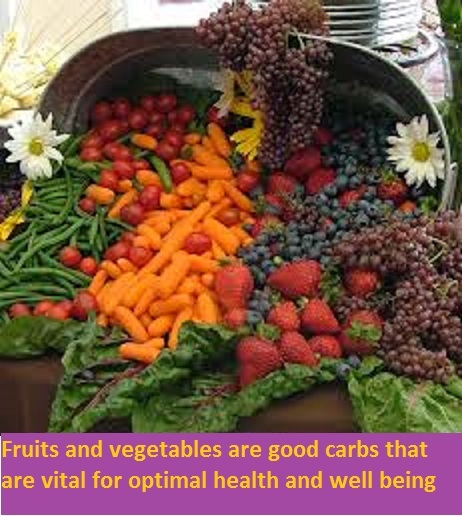 The carbohydrates you want to consume are in fruits and vegetables and in whole wheat breads and pastas. Good carbohydrates are also found in nuts, beans, and legumes. Carbohydrates you want to avoid are the ones found in processed foods and much of what is on the shelves in your local supermarket. Candy, sugary beverages, cakes, white rice, white bread, cookies, chips, etc. should be avoided. These processed carbohydrates are the ones responsible for much of the obesity epidemic. They are stripped of all their nutrients and fiber, and lead to overeating and obesity. 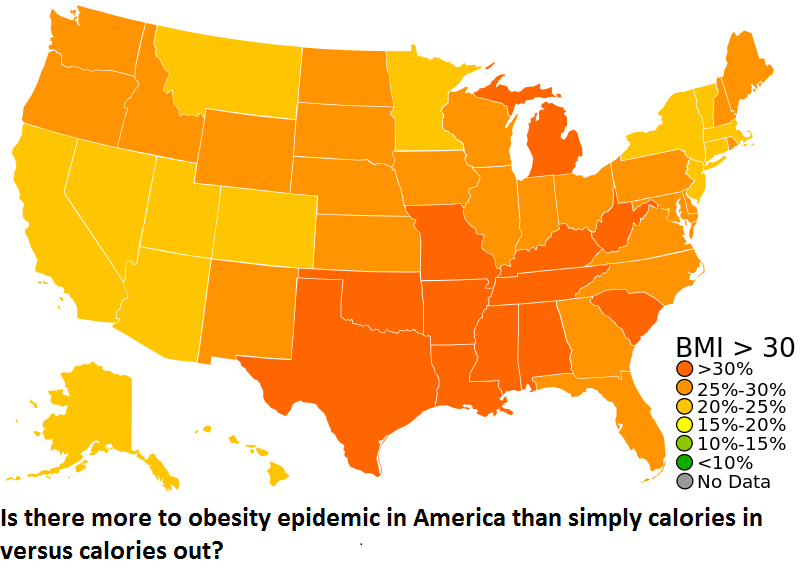 So in conclusion, there is no clear cut answer to the obesity epidemic. There are many different causes of weight gain and none of them can be blamed as the sole culprit. What I personally believe should be focused on is health rather than calories. If we exercise, eat healthy foods, limit our stresses, and have a good, clear state of mind, our weight, in most cases, will take care of itself. Although you could technically lose weight eating nothing but candy and cake, you will ensure a life of many negative health implications and most likely, an early death. As with everything in life, balance is key. Each macronutrient has numerous health benefits and is vital for an optimal diet. Consume your carbohydrates from fruits, vegetables, legumes, nuts, and beans. Consume your fats from avocados, nuts, fish, seeds, flax seed, and oils such as olive oil and avocado oil. Consume your proteins from brown rice, quinoa, breads such as ezekial bread, beans, nuts, and good, high quality sources of fish, lean meat, and poultry.